I really came to believe that I would never, ever have one of my favorite foods again. I could only dream about the delicious cream cheese and chives of my past, on crackers, baked potatoes, and if I am being honest, licked off a spoon. Well, it’s back, it’s tasty, it’s plant-based and has just four ingredients! I remember way back when I used to get those tubs of whipped cream cheese and chives from the grocery store. Usually, I did this as a treat, it was so good and such a great memory. My favorite flavor was cream cheese and chives. And I can still envision that package with the little chives on the front. So, you can imagine my delight, when I realized that there would be a chance that I could create a non-dairy version. I will be honest, I was apprehensive, and took it one step at a time, trying to not get my hopes up…too much. Much to my delight, I have something that tastes like cream cheese. So awesome! Step 1 – Gather your ingredients. Step 2 – Place cashews in a heatproof bowl and add boiling/very hot water to cover them. Soak for 10 minutes. Step 3 – Drain and rinse the cashews. 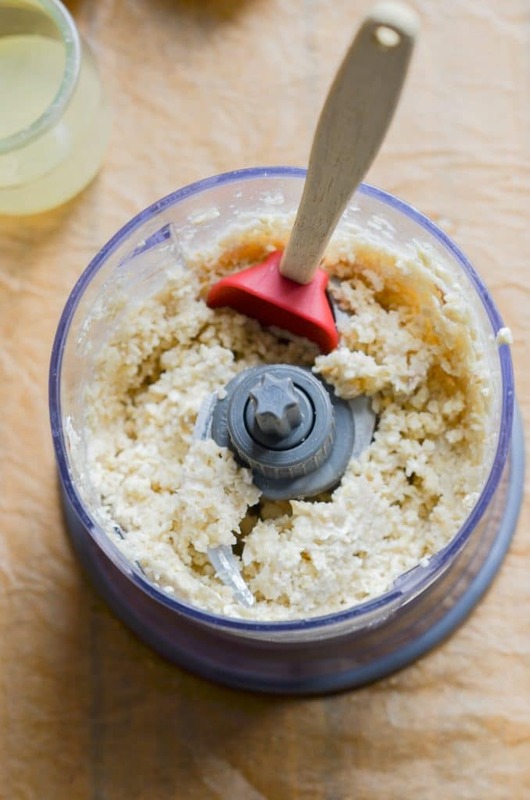 Step 4 – Place all the ingredients in a small food processor or high-speed blender. Step 5 – Blend until smooth and creamy. In the below photo, you can see the stages the mixture goes through to get to the creamy stage. Once the vegan cream cheese is blended and creamy, add additional water to get the right consistency, especially if you are making a dip. 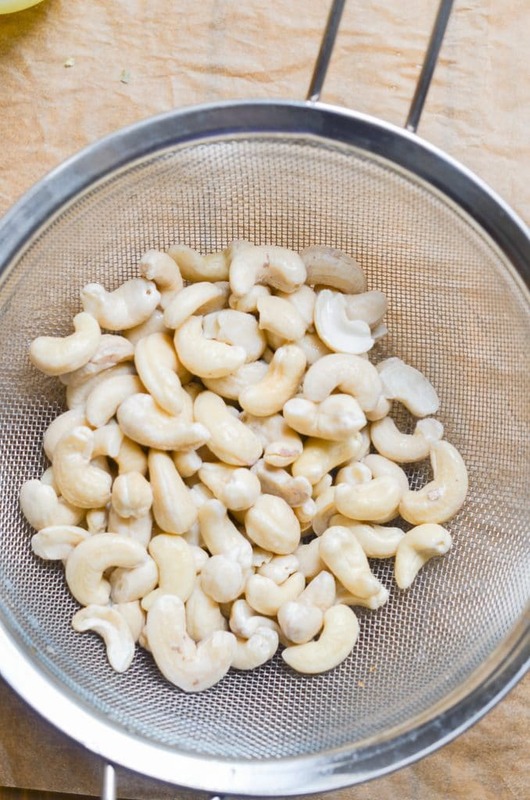 An alternate method to hot/boiling water method is to cover and soak cashews for four hours (then drain and rinse and follow directions). 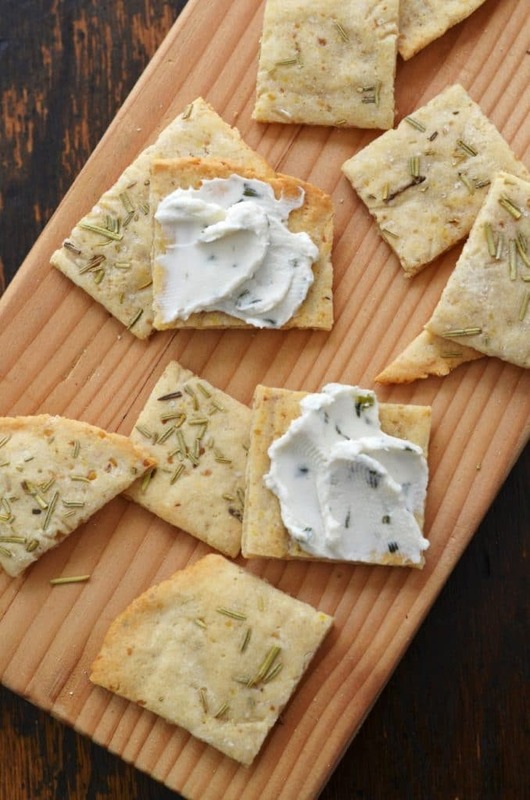 Try this dairy-free cream cheese recipe with these Paleo Crackers. 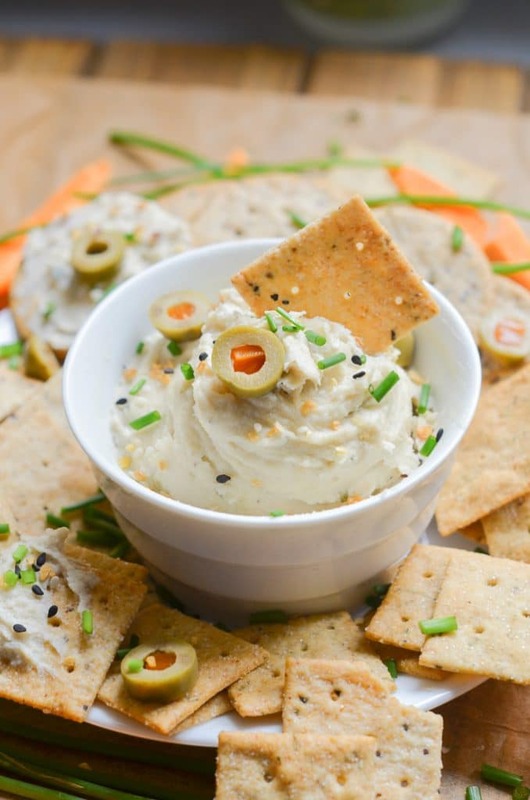 The grain-free crackers are low carb, easy to make and versatile. I often add herbs, sesame seeds or sprinkle some sea salt on them. Also, try spreading some almond butter and jam on those crackers. Yum! 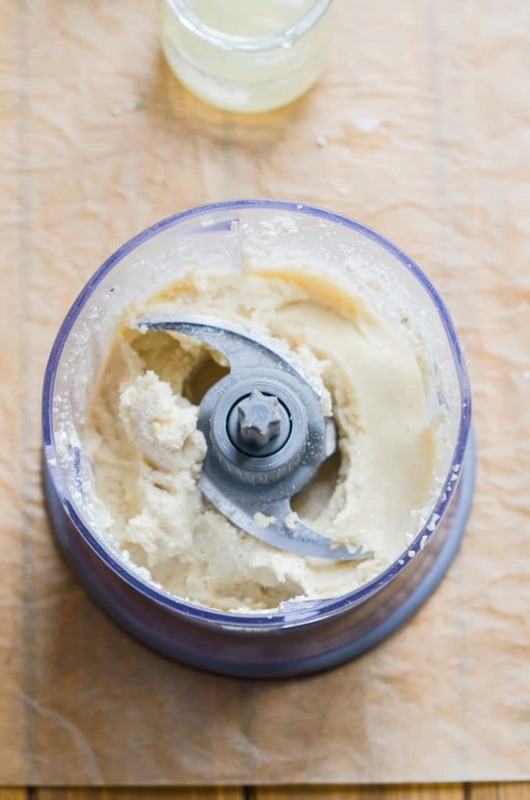 Bake until nice and crispy and then spread with this amazing cashew cream cheese. A great benefit that you will love about this cream cheese is that it does not have the additives that are usually necessary for store-bought products. There is some advance preparation required as you will need to soak the cashews. 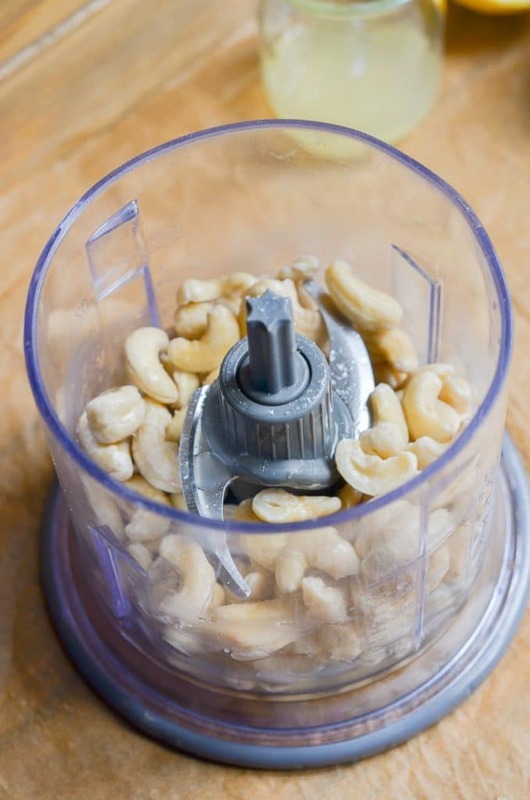 This softens the cashews to make them easier to blend. Using a food processor or blender, blend all of the ingredients for several minutes. Add a few drops of water if the mixture seems too thick. 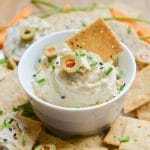 Please note: You might be surprised by who likes this vegan cream cheese recipe! This cream cheese is so good, everyone I know loves it. Yes, I know it tastes very authentic, but I was not expecting that! By the way, I am creating and testing a vegan cream cheese frosting recipe! Oh, my goodness. I used my Paleo Pizza Crust recipe to make some rolls (photo above) and then enjoyed with the delicious dairy-free cream cheese. I added dried chives, but plain is great as well. I have been experimenting with grain-free roll recipes lately. 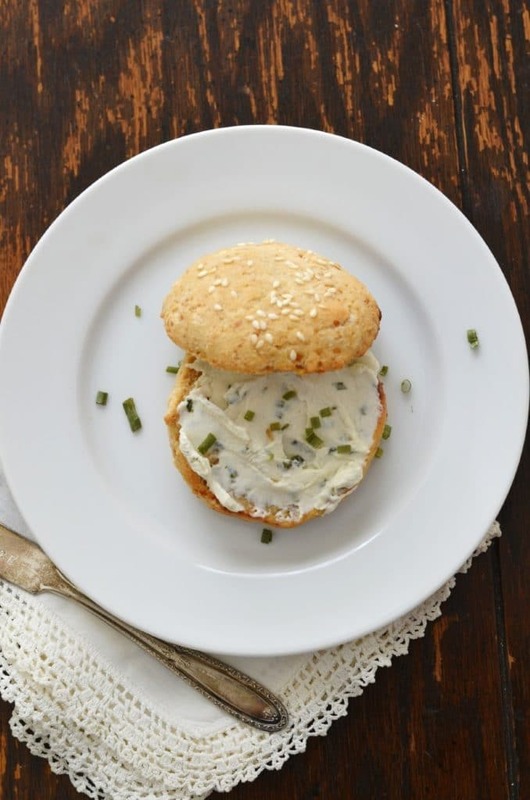 Here is a sesame seed version with some cashew cream cheese and chives. Delicious! I am using dried chives, but you could use fresh, diced chives as well. Looking for other amazing recipes? Check these out! Affiliate Link: if you purchase products using the links below, at no extra cost to you, I will receive a small commission which helps keep this blog up, running and new recipe creation possible. Thank you! This creamy, non-dairy cream cheese is very easy to make with just five ingredients. Grain-free, gluten-free and vegan! 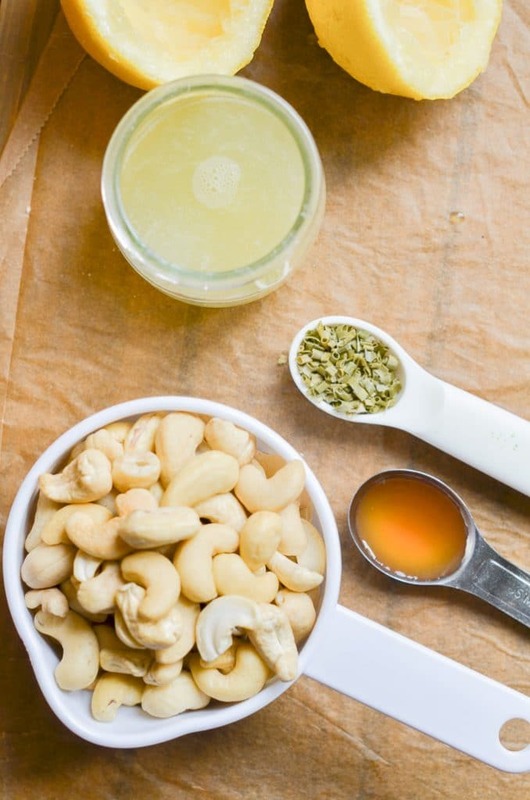 Pour cashews into a bowl. Pour very hot to boiling water over the cashews. Let sit for 10 minutes. *See notes for an alternate method of soaking. Drain and rinse cashews. 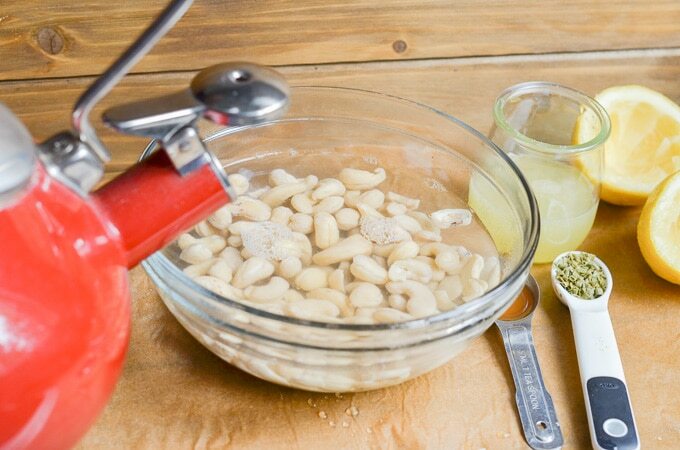 Place cashews along with other ingredients into a small food processor and blend for several minutes until very creamy and the consistency of cream cheese. Add water to reach desired consistency (if not creamy enough and if you will be using as a dip). Add additional chopped herbs or dried chives if using. Store in refrigerator up to one week. Update Notes: This post was originally published on September 14, 2016, but was republished with an updated recipe, new photos, step by step instructions and photos, success tips and a video in November 2018. Previous Post: « Awesome Vegan Granola That Is So Easy! Thanks, Christine. That’s what I ended up doing – putting them in the fridge overnight. Made it the following day and it’s pretty darn good. Day 2 even better. Hi Rosemary! Sounds great, and I agree so good! Can this cream cheese be baked in a cheesecake? Hi Jennifer, I have not tried this cream cheese baked in a cheesecake. Do the cashews need to be refrigerated when soaking overnight or can they be left out on the counter? Also, what is the minimum amount of soaking time for best results? I mean site, not sight! Hi Rosemary! In the fridge for soaking overnight. The minimum soaking time is 4 hours, left on the counter, and they are good to go. You can also pour very hot/boiling water over the nuts and let sit for 20 minutes, then rinse and use. Lately, I’ve been using the hot water method and love it! LOVE! I just finished making this and it already tastes so yummy, even without the cultures or having chilled yet. I added in some onion powder and extra chives. My fiancé and I prefer to make our own vegan staples instead of buying the prepackaged stuff. I have been craving a homemade cream cheeze spread for ages, ever since my old favorite Tofutti brand started giving me tummy aches. This recipe has already been added to our collection. Can’t wait to smear this on the everything bagels we made last weekend. Thank you for your comment! So glad to hear you love this vegan cream cheese. I have issues with store-bought products for the same reason. So, it’s nice to have an option where you can control the ingredients. I bet the added onion powder and chives made this cream cheese amazing! Sounds delicious! Such a nice vegan option! Okay! This is going down at our house. Love how it looks and I think it’s going to taste really good too.